Roads are covered with oil-based contamination and this splatters on to vehicles, particularly during rainy conditions. Oils, diesel, petrol all combine with grit and dirt on the road to form an abrasive grimy paste which sticks to the surfaces of cars. 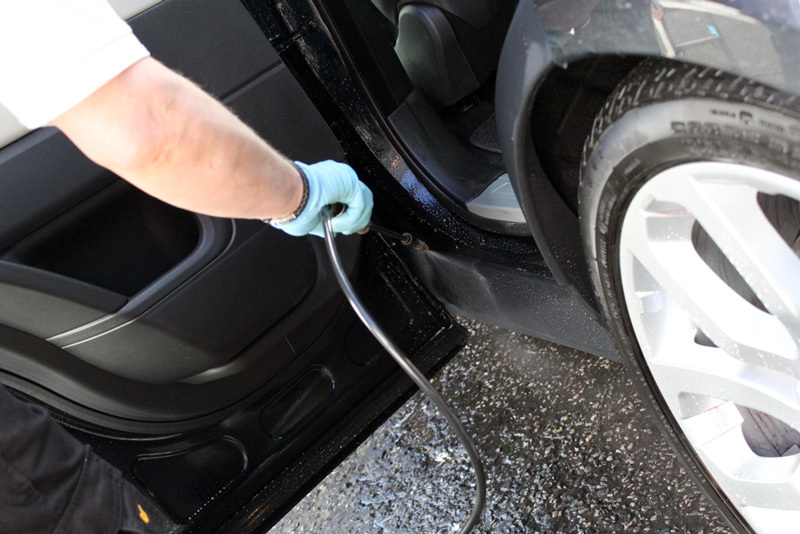 Using a degreaser dissolves the bond between the contaminants, paintwork, glass and wheels allowing them to be safely rinsed away. These products are typically called Degreasers or All Purpose Cleaners (APC) and can be water or solvent based. Some of these products will turn non-painted plastic trim and rubber seals milky white and cause pitting on exposed metal, so it’s advisable to protect these areas with detailing tape prior to application. Step 2 – Rinse thoroughly with clean running water. Check the label on the degreaser as some are not suitable to be left to dwell whilst others are safe and work better with a little dwell time.